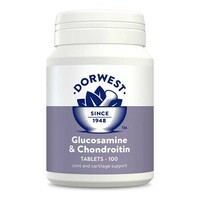 Dorwest Glucosamine and Chondroitin Tablets have been made from sustainable sources of Chondroitin and Glucosamine to help maintain flexibility and mobility. Using the most concentrated and easy to absorb form of Glucosamine Hydrochloride, Dorwest Glucosamine and Chondroitin provides the building blocks to manufacture collagen and proteoglycans in the joint cartilage and the synovial membrane, which produces the fluid to lubricate joints. I just wish I had started our 7 year old collie/lab on these sooner. After the 3 month initiation period he was markedly improved and 6 months on there is no sign of stiffness at all. Will definitely start our younger dog on these at the first sign of stiffness. been using these since my dog who is a collie x germans shephard had to have two knees, He is almost 11 years old and still thinks he is a pupppy. Great stuff. Have my arthritic Lab on these aswell as other Dorwest medicines for arthritis. As someone else said I like the fact that theres nothing else added to them. Good value and working well with our 10yr old Labrador. She made it up and down Snowdon a few weeks ago and wasn't any more stiff than the rest of us. These are working really well on our 6 year old labrador who has the start of arthritis in his front paws. Better than the more expensive version sold to me at the vets. Like the fact that nothing added to them.